Both sides started well with Dean Ballantyne shooting wide for the visitors before the Lily had a goal bound shot blocked after a good run from Alistair Elliot. Dunbar missed a great chance after 17 minutes when Darren Handling and Fraser McLaren linked well and set up Ballantyne who fired over the bar from the edge of the box. 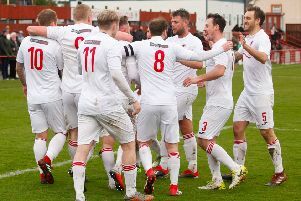 Easthouses forced two corners and Paul McDermott fired a free kick over the bar before Dunbar began to dictate with Fraser McLaren heading a Chris King corner inches wide and King forcing Steven Hay in the home goal into a save at full stretch, with Ballantyne firing the rebound into the side netting. Ten minutes before the break the Dunbar pressure paid off after a mix up in the Easthouses defence allowed Lloyd Fiddler to pick up the loose ball and fire into the net. Easthouses went close with a corner, which McCathie punched clear whilst under pressure from Graeme Young before King went close at the other end for Dunbar. Two minutes after the restart the home side might have done better after some sloppy defending by James Harley allowed Mark Brown a clear shot at goal, but Liam McCathie saved well. Dunbar went close with efforts from Ballantyne and Handling before they had a goal disallowed in the 64th minute when Ballantyne’s goal bound shot was touched home by central defender Harley who was deemed to have been offside. Five minutes later and the big defender made amends when he headed Dunbar’s second goal in from a King corner after allantyne’s shot had been turned round for a corner by Hay in the Easthouses goal. Dunbar continued to dominate and it was no surprise when McLaren scored their third goal with 15 minutes left after another King corner had not been cleared. 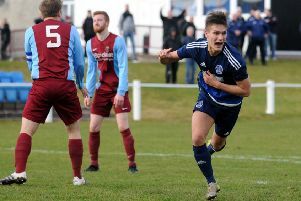 Craig Beattie had a shot blocked for Easthouses in the dying minutes before a great move involving Fiddler and Darren McCraw found McLaren inside the box and the Dunbar striker turned and fired low into the net to score Dunbar’s fourth goal and earn them a well deserved victory. Easthouses Lily: Hay, McIver, Wilson, Hall, Young, Beattie, Barrie, McDermott, Brown, Taylor, Elliot. Subs: Nethery, Arthur, Shearer, Anderson, Trialist, Curran.